Why have you gone freemium? There are a couple of reasons why we’ve gone freemium. We would see our main competitor being Microsoft Excel – it’s a great (pretty much free) product and it’s one of the first tool people use when they start their business. This creates two problems: 1) They track the wrong information and 2) they build an emotional attachment to this spreadsheet they created by hand. At some stage they need to migrate from the spreadsheet and then we become a bearer of bad news letting them know that the data they’ve been meticulously tracking is incomplete or irrelevant. Small businesses currently don’t value accounts, it’s an admin pain that provides little value to them, this is partly a problem with current accounting products being designed for accountants and partly a problem in that they won’t pay for management accountants as this can be labour intensive and therefore expensive. So we hope by providing our base product free with just a tweet a month then we’ll achieve strong early adoption. We have a strong product and we know once businesses start to us Bullet they’ll see through the rose tinted marketing of other competitors. What advice would you give others looking to go freemium? There is a lot of debate about freemium products; some providing good value and some not but there is plenty of research out there. We spent about 3 months researching our customer data, other companies’ experiences, the market, the competition, what kind of distribution deals have been done with competitors in our industry and we focused a lot on other industries. I’d tell them to think very hard about it. We decided to bootstrap Bullet Accounts and Payroll because we wanted to be lead by the customer, not the VC. I think the key things you need to look at are the value your product gives. For example, is it an administration tool or a tool that increases sales, the later bringing higher value. Who your customer base is? Are they cash rich, where offering free product devalues your position. How long can you keep them? Life time value is a dangerous number to play with, especially if you’re in a new industry. What are your costs of delivering your service? If your streaming video that’s going to be an expensive service to deliver. Is there a lot of competition, and how is it positioning itself? We didn’t take the decision lightly and only took it after we’d proved to ourselves people we’re willing to pay for our service and stick around. We’ll be documenting the whole experience along with some of our growth tricks so be sure to signup to our blog if you’re interested in learning more. 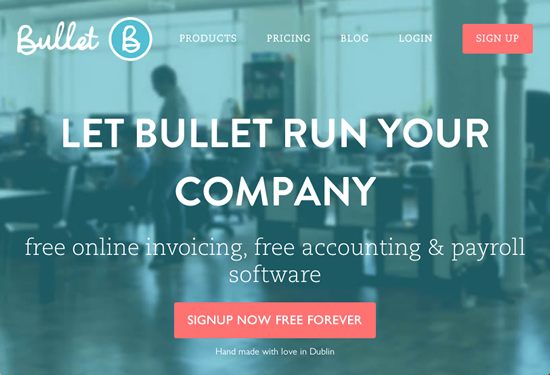 Freemium and a €1,400 Bootstrapped business do they go together? Well, like I’d mentioned we think bootstrapping at the beginning gets you to focus on the customer, not the noise. Freemium forces you to use your product as your key marketing tool when you’re looking to build growth, so that is a natural fit to us as a company. We already have a network effect happening in the accounting product, we have high quality smart connected customers signing up everyday so we just want to accelerate that. Having someone you trust and admire in business tweeting about a product makes our job of selling Bullet as a solution very easy. How sure are you about the power of Peoples tweets driving your product? We’ve already had huge success with our ebook ‘How To Get 100k Off The Government For Free’, we used a service called ‘Pay With a Tweet’ to drive it’s reach. Basically to get access to the ebook download, you had to tweet out a message telling others in the startup community about it, so it’s a win/win for everyone. We’d hit over 5,000 downloads with that eBook and gained a lot of word of mouth. It was our primary driver of quality targeted traffic which resulted in signups. We knew from our customer base we had a network effect and we were looking to target more web savvy customers and felt this was a smart way to do it. Customer acquisition always has a cost, you either pay or give to get it, and giving fitted better with our feelings around community and support. So are you replacing the accountant? Absolutely not, but we see the role of accountants changing. In other countries they’ve taken on more of a financial advisor role. That’s a great thing for both accountants and businesses. Accountants are highly qualified and can add huge value to a business; we hope that Bullet frees up more of the day to day side of activities allowing more time to be spent talking strategy. Why are you letting people keep the package free by tweeting out your product? We’ve spent the last year working out who our customer is, not surprisingly they comprise of media and web companies since we’re an online business. We’ve had a look at our data and every company in our product is connected to one another an average of 3 times, so the network effect is already happening. We monitor our social media channels and it reflects this finding, we’ve a large base in London, Berlin, Dublin and NYC tech hotspots, with a good majority of our followers having twitter accounts over 5 years old meaning these are influential early adopters. So although it might sound trivial that a customer has to tweet. We bootstrapped this company to focus 100% on customers, they know that and that’s why we’ve no customer churn. Also not following the traditional distribution model of accountants has raised some eyebrows. This might sound like we’ve shot our distribution channel but like I said we’re levering the community of users we have; thats our distribution channel. We keep them happy and they’ll be the ones telling their colleagues about Bullet at 2am when they’re pulling their hair out. The internet decentralizes distribution, we want to embrace that the community is our ecosystem. We provide the full invoicing and accounting with no caps 100% free with a tweet every month, but we charge for payroll currently at €4pm base price and €3per employee per month for the first 10 and then €1 per employee per month thereafter. We have a number of revenue streams launching, like an in app marketplace to allow developers build on small business data, data storage, and some other ideas. We have a pretty much zero churn rate and we know the life time value of a customer in accounts is about 10 years so that gives us plenty of time to build value out of the customer. I think when you’re trying to reinvent a product you have to do it from the ground up, that includes the business model. Heavily funded companies in the consumer market have made it harder and harder to charge for online product, so you almost need to look at your product as the marketing tool to generate revenue. Peter Connor – Worked in it IT 20 years on launch product such as RaboDirect. John Farrelly – Worked in IT 20 years, Java Developer specialising in high availability systems. John and Peter started working on Bullet just over 2 years ago with €1,400, and launched it to the public at a community event called Dublin Beta, winning the peoples choice award going on to winnings an Eircom Spider and silver at the Vodafone Startup Awards. Since then we’ve grown popular with early web and media adopters and have a strong following in New York, Dublin, London and Berlin. Bullet has been featured in news outlets from Dublin to San Francisco, and have been involved in the web community doing regular talks on their eBook ‘How To Get 100k Off The Irish Government’.